Our Hotel "Daytona" in Dasburg is very suitable for motorcyclists. It is situated in the magnificent valley of the river "OUR" in the German- Luxemburgian Natural Parc of the Sudeifel. This area of outstanding natural beauty lends itself excellently to the most fantastic tours on your motorbikes. There are many exit roads to our neighbouring countries Belgium and Luxembourg. But there are also many terrific routes available for walkers, hikers and cyclists, leading you along challenging paths in a beautiful environment. 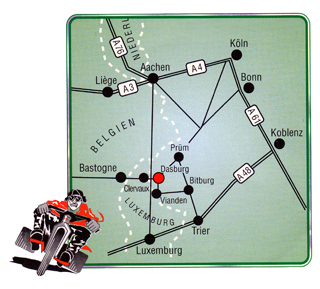 Hotel Daytona is situated about one hour drive from city of Luxembourg. Are you interested in getting into the right mood, please consult "scenic routes". Payment at Hotel Daytona is cash only on departure. Until recently there was an ATM opposite the hotel, but unfortunately it was removed. The municipality of Arzfeld will charge 1 euro per person per night to tourist tax.